3 kW Far Infrared Heater Rental – VAL6 WPS-30, is available for rent in Rochester NY, Ithaca NY and the entire Western New York region from the Duke Company. The rental VAL6 WPS30 is notable for its far-infrared heating can be rented, has capability that is able to penetrate deep into an object. 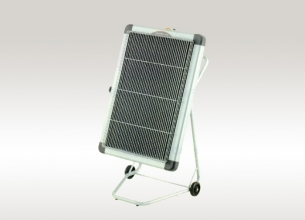 This heater features wide heat distribution due to the large radiation panel. This model heater reduces the risk of fire due to the lower surface temperature on the heating panel. Safety devices include: tip over detection, overheat protection, auto-restart prevention fuse. Applications include: lobby entrances, factories, warehouses, showrooms, workshops and meeting rooms.